The Red River Folk Festival was born in the fall of 1963. Well, we think it was anyway. The only sure way to know is if you happened to be playing in the band that night. So in 1963, upon the arrival of three hungry musicians, Rick Fowler, Wayne Kidd and, Ray Wylie Hubbard the Red River Folk Festival was born. These boys became known as Three Faces West and began playing regularly in the Red River Valley. They set a high bar when it came to the folk music scene in Northern New Mexico. A music scene which is still very much alive today. During this time in Red River the valley experienced an influx of music. Every picker west of Texarkana had to come and see what these southern rocky mountains had to offer. Whether you were kicking hippies asses and raising hell or just wanted to be a cosmic cowboy, it seemed that a music mecca came to exist within this unsuspecting town that still boasts a population of less than 500 people. Five hundred people. Now you’re probably thinking, Well….who’s gonna be at this dadgum folk festival?! Red River has always been a popular town with lots to offer Heck, the crowd during our annual Memorial Day weekend Biker Rally typically swells up to 20,000. We’ve got plenty of room and Red River is also a great place for camping, fishing, hiking, biking, off roading, horseback riding and more. Heck it’s an outdoor party all year long. Have a look at some of the options when staying in Red River, NM. Now lets get back to the music. There are a few more things you need to know about these folks who helped start the Red River music scene. You need to know who they were, who they are and, what they’ll leave behind. We’ve had celebrated characters such as the beloved Bill & Bonnie Hearne. They’ll steal your heart away and make a friend out of you. We’ve got legendary songwriting in the air and sitting at bar stools. A fellow named Michael Martin Murphey has been hangin’ his hat in Red River since the early 70’s and he’s sung a lot of songs about the Red River Valley. HIs latest record is titled Red River Drifter. Or, how about that young songwriter who used to be the lifeguard down at the public pool? He has had us singing his hit “My Maria” for over 40 yrs. It wasn’t enough for B.W. Stevenson to hike that song up the pop charts so Brooks and Dunn had to borrow it when Buckwheat was done. Just recently a team of archivists from Texas Tech paid a visit to Red River and took notes on the music history of our town, and they said that if it wasn’t for Red River there wouldn’t have even been a live music scene in Austin Texas. Thats right. They said that according to the information they gathered, thanks were owed to a few key characters, that resided in Red River and then migrated to Austin, that started what became the live music scene in our nation’s beloved live music capitol, Austin, Texas. These days, some folks continue carrying the musical torch in Red River. Just about any night of the week you can walk into a saloon and catch Mike Addington and his band singing some of the finest folk and country standards ever sung. And as sure as the moon shines, there’s always gonna be someone younger and sharper. Jed Zimmerman and his breed of southern folk picking songs seems to fill those shoes today. There’s another fella named Max Gomez who’s been playing around Red for a few years now, and he’s doing amazing stuff. Made him a record for Warner Bros. When the younger generation is growing from a solid foundation, they somehow make it look easy. All that said, there really is only one chief today of the Red River Folk scene and that’s Steve Heglund. Steve has lived and worked in Red River for many, many moons and has been the number one dog in our fight for good live music. Currently he operates five music venues in little old Red River and puts forth a great deal of hard work in keeping the music alive. So remember that you are invited to join us at the second annual Red River Folk Festival September 22nd, 23rd, & 24th. There ain’t a better time to be in northern New Mexico. 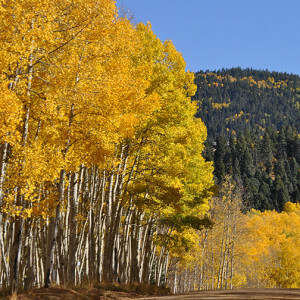 You’ll get to see the Aspencade Arts & Crafts Fair and 360 panoramic views of the mountains covered in fall foliage. The weather will be warm and sunny during the day and cool and calm at night. Come for the fresh air alone. Stay and be part of a musical heritage and help keep this music alive. You could say that our whole vision for the Red River Folk Festival is to keep the music alive. The tradition of great songs and great performances. The one time memories of impromptu sing-alongs that will never happen again. To keep the torch lit for generations to come. To make music of the folk, for the folk, and by the folk.